Longines is the oldest registered brand name still in use today. The company, founded in 1832, is a pioneer in the fields of sport and aeronautics timekeeping. Highlights from the brand include chronographs and watches with an annual calendar. The Swiss luxury watch manufacturer Longines has a history stretching back 180 years. The business is known for their high-quality timepieces. Longines chronographs, with their winged hourglass logo, have been timing horse races since the end of the 19th century. Today, Longines watches can still be found at horse races as well as at tennis matches and ski competitions. This manufacturer's timepieces feature technological innovations in the world of professional timekeeping; Longines even developed their own timing system for horse racing. The system displays positional data in real time that's accurate to 5 cm. Longines offers both women's and men's watches characterized by traditional-elegant designs and excellent value for your money. There are five main watch collections: Elegance, Watchmaking Tradition, Equestrian, Sport, and Heritage. Longines has a wide range of timepieces available that fit every taste and budget. Most of the watches feature classic, elegant designs. However, those who want a sports or diving watch will find excellent timepieces in the Conquest or HydroConquest models. 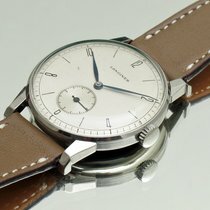 How much do Longines watches cost and which models are the most popular? In celebration of the Flagship's 60th anniversary, Longines introduced a limited edition of the timepiece in 2017, the Flagship Heritage 60th Anniversary . Actress Kate Winslet, a Longines brand ambassador, selected the retro watch's elegant design. Longines' watchmaking highlights can be found in the Master Collection, which includes models with a chronograph function, moon phase display, and an annual calendar. The sports series have been part of Longines' portfolio since 2007. The timepieces in the HydroConquest and Conquest series were made with athletes and lovers of sporty wristwatches in mind, and are powered by automatic mechanical or highly precise quartz movements. The HydroConquest is a diving watch waterproof to 300 m (30 bar) with a unidirectional bezel and screw-down crown. There is also a chronograph version available. Even in the dark, it's easy to read this timepiece, seeing as the hands and numerals are coated with Superluminova. Bicolor stainless steel and gold-plated versions are also available. You can purchase a pre-owned three-hand quartz Longines HydroConquest for less than 500 euros. New diving watches from this collection are available for around 600 euros. A quartz chronograph costs around 800 euros pre-owned and 1,000 euros new. 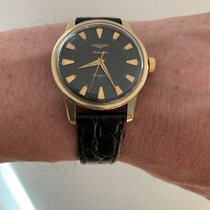 If you prefer an automatic caliber, you should plan on spending at least 750 euros for a pre-owned timepiece or around 800 euros for a new one. Prices for pre-owned automatic chronographs with a metal bracelet start at 1,100 euros, and new watches cost 1,300 euros. The Conquest series consists of chronographs, three-hand watches, and GMT watches. GMT watches display a second time zone, a feature which is helpful for frequent fliers who always want to know what time it is at home. Chronographs function as timers, some of which can time to 1/100th of a second. The Horse Racing, Alpine Skiing, and Roland-Garros models are dedicated to horse racing, skiing, and tennis, respectively; all sports in which Longines timepieces are actively used. These three quartz watches are so precise that they can time to 1/100th of a second. New, the timepieces cost around 950 euros. Longines was a pioneer in quartz watch technology. They developed their first quartz watch by 1954 and set chronometric records. Towards the end of the 1960s, they introduced the Ultra-Quartz series, which was composed of electronic wristwatches. The current Conquest V.H.P. model follows in the same tradition. The abbreviation V.H.P. stands for "very high precision." The timepiece lives up to its name; it only deviates from the correct time by five seconds a year. It also features a perpetual calendar and a gear position detection system which independently corrects the position of the hands if they move due to magnetism or a jolt. The battery life lasts for around five years, beating out traditional quartz watch batteries by about 24 months. The price for a new Conquest V.H.P. starts at 900 euros. The Master Collection is dedicated to Longines' watchmaking tradition and exclusively consists of mechanical watches. Automatic movements power most of these models. The designs of the watches in this collection combine classic, elegant elements with sporty, modern ones. One of the highlights of this collection is a timepiece with four retrograde displays: day of the week at 12 o'clock, a small seconds at six o'clock, and a second time zone on the left side of the dial. There's also a moon phase display on the lower half of the dial and a day/night indicator underneath the day of the week display. The timepiece is powered by the caliber L707, which the ébauche manufacturer ETA produces exclusively for Longines. If the caliber is fully wound, it can power the watch for 48 hours. Pre-owned models cost around 2,200 euros, while new versions cost around 2,700 euros. One of the most intricate Longines watches is the model from the Master Collection with a chronograph function, annual calendar, moon phase display, and 24-hour display. The date is displayed via a long central hand ending in a half moon. The day of the week and the month are displayed on the 30-minute counter at 12 o'clock. The small seconds, together with the 24-hour display, are found on the subdial at nine o'clock. The third subdial is at six o'clock and displays the timer and moon phase display. The caliber L678, based on the ETA/Valjoux 7751 , powers the timepiece. You should expect to pay around 1,900 euros for a pre-owned version of this timepiece in very good condition; for a new one, expect prices around 2,200 euros. The Heritage Collection is home to Longines' historically inspired retro watches. Some resemble classic dress watches and go perfectly with a nice shirt or suit. These include the Longines Conquest Heritage and the Longines Flagship Heritage . You can purchase the Conquest Heritage new and pre-owned for less than 1,000 euros. The Flagship model is available for 1,200 euros new. The Legend Diver Watch, on the other hand, was inspired by 1960s diving watches. Unlike most other diving watches, the bezel used to keep track of your dive time is under the watch glass and controlled by a second crown. You can purchase a modern pre-owned Legend Diver for around 1,300 euros, while new, it costs 1,500 euros. You should plan on spending around 12,000 euros if you want to buy a vintage timepiece from the 1960s. 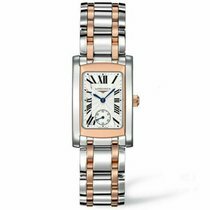 Longines also offers many women's watches, mainly in the Elegance Collection. Models in the DolceVita series feature rectangular cases and are made of materials such as stainless steel or 18-karat rose gold; bicolor models are also available. Models with diamond-set dials and cases are especially elegant. You can purchase a pre-owned DolceVita timepiece for around 400 euros; prices for a new watch start around 800 euros. Models from the PrimaLuna Collection have round cases and metal bracelets. Diamond-set bicolor stainless steel and gold versions have an especially feminine look. Prices for these timepieces start at 700 euros. The Symphonette models blend the traditional and the modern with their oval cases, some set with diamonds. You can purchase a stainless steel Symphonette for 1,000 euros. The women's Equestrian collection pays homage to Longines' involvement in the sport. Watches in this series are characterized by their lugs, which resemble horseshoes or stirrups. New Equestrian watches are available for around 900 euros. The pioneering pilot Charles A. Lindbergh flew nonstop from New York to Paris in 1927 in what was the first solo flight across the Atlantic. A Longines timepiece was responsible for timing the flight. After the solo flight, the watch manufacturer, together with Lindbergh, developed a pilot's watch with a navigation mechanism. With the help of the Lindbergh hour angle watch, a sextant, and a nautical almanac, pilots could determine their exact geographical position. Longines became the official timekeeper of the World Air Sports Federation in 1919. Longines presented a limited edition hour angle watch with a run of only 90 pieces in 2017 in honor of the 90th anniversary of Lindbergh's flight: the Lindbergh Hour Angle Watch 90th Anniversary. The retro watch is similar to the original model in terms of its size and design. It has a diameter of 47.5 mm, making the watch very easy-to-read. New, the standard Lindbergh Hour Angle Watch costs around 3,200 euros. In addition to aviation, Longines has a second passion: timing sporting events. By 1886, Longines had equipped most horse race tracks in New York with their timepieces. The company remains active in horse racing today. They developed their first quartz timepiece in 1954, which set a precision record at the observatory in Neuchâtel, Switzerland. The timekeeping instrument "Chronocinégines" had a 16 mm camera and took 100 pictures a second. Longines also has a presence in professional skiing, gymnastics, tennis, and archery. Longines' history goes back to the summer of 1832, when the 23-year-old businessman Auguste Agassiz established himself as an active partner in the watch business Comptoir Raiguel Jeune in the town of Saint-Imier, Switzerland. Comptoir purchased ébauche movements and passed them on to watchmakers. Agassiz was so successful that he took complete control over the workshop in 1846. However, health problems forced him to find a suitable successor. He chose his nephew Ernest Francillon, who joined the company in 1852 and took over a short while later. Francillon quickly realized that the Comptoir business didn't have sustainable production processes. Therefore, he began considering mass production. When a piece of land on the bank of the River Suze was put up for sale in 1866, Francillon took advantage of the opportunity and purchased it. Francillon's land was in a spot known as "Les Longines" ("the long meadows") and perfect for establishing a factory. Francillon inaugurated the workshop in 1867. In the same year, they produced their first in-house movement, called 20A, which won a prize at the World Exhibition in Paris. Over the years, Longines industrialized their production processes more and more, making them a trailblazer the mechanization of watch production. The Swiss luxury watch company Longines has earned their place in the watchmaking history books. From revolutionizing the means of production to pioneering flight technology to timing professional sports, the company is an expert in precision and high performance. The company has belonged to the Swatch Group since 1983, and thus the watchmakers, designers, and design engineers have access to the concern's most modern technology. However, the manufacturer always remains true to their own tradition, producing predominantly classic, elegant watches for men and women . For Longines, as their motto states, elegance is an attitude.